Ask for the objectives, goals, and interests of your audience: An annual market share overview presentation will differ from a presentation to your employed physicians or a service line growth presentation. Find out what your meeting is all about—What do we want to know about this quarter? About physician volumes? What new insights did we discover? Share your visualizations beforehand and find out how team members like to see data: Once the objective is clear, it’s time to gather and manipulate data into key points. Using Excel, Esri’s ArcGIS, or Stratasan’s Pathway tools, you can manipulate your data to turn it into insights. Everyone likes to see data differently, whether it’s a pie chart, mapping visualization, or a straightforward table, there are countless ways to present the most important findings to your team. As demonstrated in the GIF below, Storyboards will allow you to easily add these insights to your presentation. You can also add to multiple Storyboards, sharing the same snapshot in more than one place. Slice and dice data to get the right answers and visualizations: If your team is looking at a specific service line, you may want to filter down to certain sub-service lines or show both Outpatient and Inpatient data. Depending on the answers you’re looking to deliver to your team and the foreseen questions they will have, you will need to play around with your LaunchPad or Loyalty report to present the data your team would like to see. The ultimate goal of a strategic planning presentation is to spread knowledge that can lead to informed decision-making. In order to do that, the intelligence you share must be clear and presented in a digestible format. Storyboards is a tool that allows you to do just this—quickly, easily, and with the flexibility to make adjustments mid-meeting, when needed. With Storyboards, our clients create interactive presentation decks in minutes, from which they can present and facilitate meetings directly from the Stratasan application and answer questions in real-time. Plus, the data in a Storyboards presentation will auto-update when new data is available. So, once you’ve made a Storyboard, you can return to the same one each time there is a data update. Regardless of which tool you're using, fully explore the feature set to better understand the capabilities and how the tool will equip you to share intelligence with your team. Consider things like: modification, sharing and editing rights, and interactivity. Your first inclination may be to stick to trusted tools you’ve used in the past, but when exploring new presentation opportunities, consider trying a new strategy, as it may work better than you think. 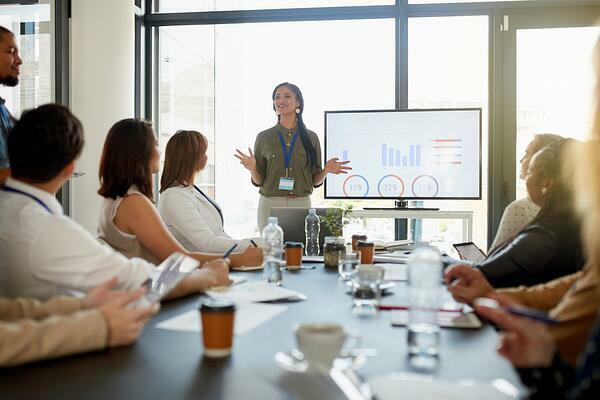 For instance, downloading snapshots from your Stratasan LaunchPads or Physician Loyalty reports and then presenting from Microsoft Powerpoint may seem like the best strategy, but this actually greatly limits how you can interact with your presentation. Many of our clients have realized the value in presenting directly from Storyboards, where they can modify their presentation while in present mode. You can easily create and share Storyboards before or after a presentation so your can spend less time crafting a presentation and more time uncovering data insights. Storyboards is also enabled to hold physician data, state inpatient and outpatient data, and Medicare data all in one presentation. If someone wants to see your presentation in pure table format, flip to it— tables, quarterly graphs (only in Loyalty), pie charts, and bar graphs. Once you’re presenting, it’s easy to toggle to different visualizations for team members who like to see data differently. In a Physician snapshot, you could get a look at quarterly volumes and year over year volumes in the same slide by clicking into the line graph view. To view your market share or payer mix as percentages, toggle over on the pie chart in any LaunchPad snapshot. If you want to identify a ZIP code or county on the map, just hover of it! To bring your data to life, show a mapping visualization in your presentation to display which ZIP codes your patient population lives in or which facilities are both inside and outside of your service area. While presenting, zoom in or highlight specific ZIP codes and facilities to display their names. Making a change mid-way through is no problem. You can easily make edits and get your into LaunchPad, ready to present insights in a digestible format. Look for a tool that with optimal sharing capability (ie. not email!) Stratasan’s solution to this is Gallery. Gallery is a secure sharing platform on the Stratasan app that allows you to share presentations. Team members can log in directly to the Gallery portal without having had an account to use other Stratasan tools. Consider your audience when sharing follow-up materials: Rather than sending an entire presentation over to a member of your team, send them particular slides that they had questions about or wanted to look at after the presentation. Downloading slides from LaunchPads, Loyalty reports, or a Storyboard is simple and so is filtering to show the data in a different way than you presented it. Don’t limit your follow up only to the team members present in the meeting. Often, there are many people who would benefit from the visibility into the intelligence shared in the meeting, even if they weren’t present for it. Think through appropriate team and team members, and share materials along with any additional context necessary. Below is GIF demonstrating how you can share your Storyboards with multiple team members at once. Strategy meetings and presentations, especially to C-suite executives, can be daunting. But, when equipped with the new Storyboards functionality, you’ll be ready for anything. Need to answer unexpected questions about past performance mid-meeting? Do your organization’s key stakeholders need more insight into certain figures? 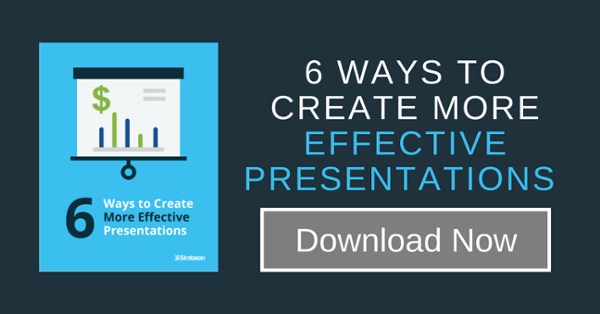 Need a quick and easy way to share your presentation before and after the meeting? No problem, Storyboards has you covered! For more information on how Storyboards can equip you to be a strategy meeting pro, contact Sean Conway today and ask for a demo of our Storyboards features, functionality, and capabilities.